Isoxazoline is the active ingredient in 4 different FDA approved flea and tick prevention products, some of which we offer, and recommend here at Tampa Veterinary Hospital. The 4 prevention products are Bravecto, Simparica, Credelio and Nexgard. I give my pet one of these products. Should I be worried? This is directly from the FDA. As a veterinarian, I take the role of recommending/prescribing any product (or medication) very seriously. I must consider a wide variety of factors before I choose to offer it to you for your pet. One of the most important questions I must ask is ‘How safe is this product?’- and how will it potentially affect your pet both short and long-term. The FDA has already vetted the product’s safety over months (if not years) of clinical trials- so I must then consider if the product is appropriate for each individual pet we offer it to. Bravecto or Simparica may be a good choice for one pet, but not for another based on their specific medical histories. While we do not dispute the FDA’s claims, we must consider the statistics involved. We have not been provided with any concrete numbers specific to exact incidence rates nationwide. The only thing that we have been told is that the incidence of neurologic events are ‘extremely rare’. Extremely rare, in this context, is less than one adverse reaction in 10,000 doses dispensed. That is less than one tenth of one percent. So are these products safe? Yes, we believe so. We have been offering both Bravecto and Simparica since their release, and we have not had one reported adverse reaction. Not one. That’s not to say that your pet can’t have an adverse reaction. If your pet is one one of these flea prevention products, and they have any type of adverse reaction, let us know immediately. We will report it to the manufacturer who is required to file a report with the FDA. If you wish to report the adverse reaction directly to the manufacturer yourself, you can do so- their phone numbers and websites are included in the FDA alert fact sheet which can be found here. If your pet experiences any of these symptoms- at any time- you should notify your veterinarian immediately. If your pet is on one of these flea/tick prevention products, you should mention this to the veterinarian during their examination. As I mentioned, these events are extremely rare- but we are taking this issue very seriously. We will continue to offer Bravecto and Simparica at Tampa Veterinary Hospital. If you wish to discuss alternatives to these products, we do have alternatives we would be happy to discuss with you. 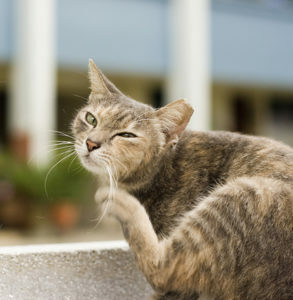 For more information on why your pet should be protected from fleas and ticks, check out my blog on that topic. This is exactly why I love Tampa Veterinary Hospital and why I drive all the way from Brandon for every visit, passing easily 20-30 other veterinary options along the way. It comforts me to know my best friend’s care is based on evidence and carefully reviewed data rather than fear and speculation. I appreciate TVH not jumping the gun on media reports and low statistical significance and I know if the actual data starts turning the other way, they will be all over it. Thank you Dr. Webster and team!